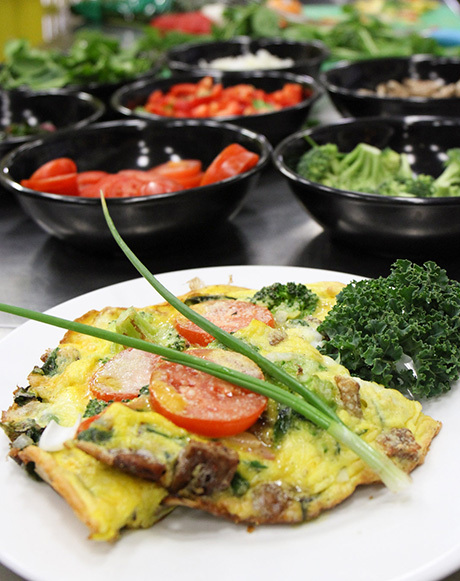 In this month’s Farm to Fork series, we are featuring a healthy, delicious and highly adaptable recipe for a Farm-Fresh Vegetable Frittata. Frittatas, a traditional Italian dish, are one of those versatile meals that can not only be eaten for breakfast, lunch or dinner, but can be assembled to fit any flavor combination you desire! One of its most notable qualities is that it’s packed full of nutrition, from protein to the vitamins in the vegetables you add. 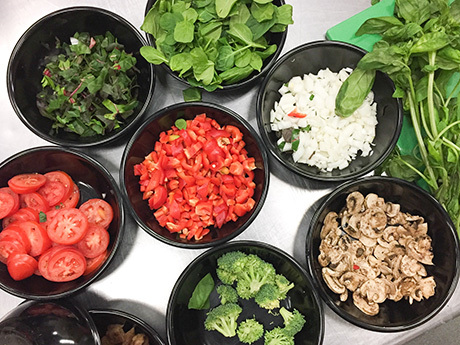 In this recipe, St. Vincent de Paul’s Head Chef, Chris Hoffman, used sustainably fresh ingredients from our Urban Farm to bring the most nutrition to our palate. Green was a predominant theme, bringing high potassium from the Swiss Chard and broccoli, and a fragrant sweet touch from fresh basil. 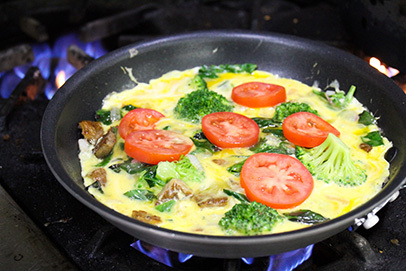 What vegetables would you add to your frittata? We’d love for you to share your favorite combination! 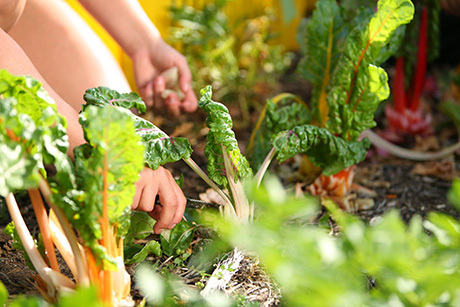 Tag us on Facebook, Twitter, or Instagram with your posts using #SVdPFarmtoFork. 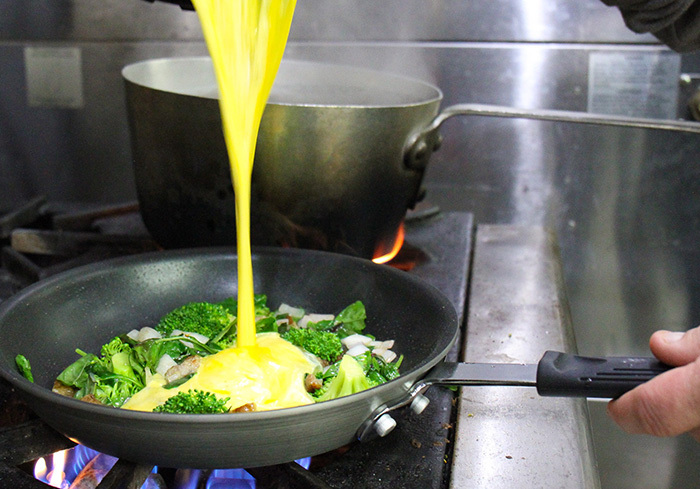 Preheat the oven to 350 degrees F. In a 10-inch oven-safe skillet, heat olive oil over medium-high heat. Add the onions and cook until softened, about 5 minutes. Add the rest of your veggies and saute until slightly cooked through and the veggies are a bright green color. Whisk the eggs, milk, salt and pepper in a bowl. Pour egg mixture into skillet, stir and cook for 5-7 minutes until edges start to pull away from pan. Add your tomato slices after stirring the mixture. Place the skillet in the oven (be careful and use a potholder as the skillet handle will be hot!) and bake for about 20 minutes, until the middle sets. Let it cool and enjoy! Our Family Wellness Program, which provides the nutritional information for each Farm to Fork recipe, is a culturally responsive program. Our health educators teach bilingual classes to reach more in our community. Below is the recipe in Spanish! Precalienta el horno a 350F. En un sartén de 10” que sea seguro para usar en el horno calienta el aceite a fuego medio algo y agrega la cebolla, cocínala hasta quedar suave por aproximadamente 5 minutos. En un tazón bate los huevos leche, pimienta, y sal. Agrega los vegetales y la salchicha, incorporando los ingredientes hasta quedar bien batidos. Agrega la mezcla de huevo al sartén y cocina 5-7 minutes, hasta que la orilla se empiece a despegar del sartén. Pon el sartén en el horno por aproximadamente 20 minutos, hasta que el centro este firme. Sirve y disfruta!